This week I did two marginally clever things which I will share with you. 1. Makeshift Sangria for times when the cheap red wine is just not cutting it. Usually my method involves 50% orange juice 50% wine. Maybe some ice. Trust me! It's actually good. I had no OJ so I cut up two strawberries and squeezed the juice of one baby clementine into it. (My roommate's. Sorry.) Then I scooped out the pulp and threw that in, too. Not bad! Pictured: the "Original" size. It's MORE than enough. 2. 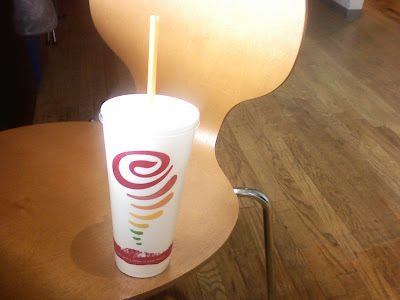 Jamba Juice Jig I love the smoothies there which only contain yogurt, soymilk, and fruit. Sunrise Strawberry and Blueberry Sunrise, I believe. I was getting a little tired of both of them so I ordered instead from the "All Fruit" menu, the Mega Mango flavor. I asked if they could add some plain yogurt to it. No one there is interested in re-calibrating the percentages so both times I did this I ended up getting a size larger than I ordered. Sneaky! But also embarrassing because I feel like WHO ORDERS that giant styrofoam size? You need two hands to even hold it up. Order the small, and then you'll get the medium. I promise. Reach for the moon, and even if you fail you will fall amongst the stars, or, something like that.